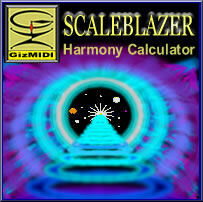 ScaleBlazer doesn't have some of the extended calculation features, nor the midi auditioning and analyzing capabilities of Scout, the harmony calculator in Harmatrix. It does have all the chords and scales, plus some added features to answer your other theory related questions. It even has a precision BPM to milliseconds calculator built in. It is a handy, compact composer's assistant that's great on its own or as a second calculator for Harmatrix. Instantly find all the 3 - 6 note chords in any scale or find all the scales containing a selected chord. 3060 chords and 744 scales. Over 10,000 matches. Gives modes and mode roots for all scales. 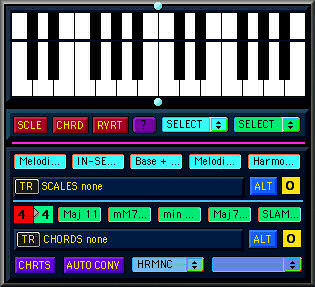 Enter and display chords/scales on virtual keys or via menus. Precision BPM to Millisecond to BPM calculator for 64th notes to whole notes, including dotted notes. Pull-down charts for intervals, circle of fifths, modes and mode intervals. Automatic conversions to Dorian Origin. Includes manual plus the "Crash Course in Music Theory and Dorian Origin". Works with MAC OS X 10.2 or higher, or Windows XP. Best of all, it is FREE (download).